Can you quickly put your hands on critical documents and information in case of an emergency? Do your loved ones know how to access your valuable online information or handle your affairs in the event of a life-changing event? If you answered no, now is the time to get your documents in order, and it’s never been easier, thanks to No Time Like Now, A Guide To Organizing Your Life’s Traditional And Digital Information. 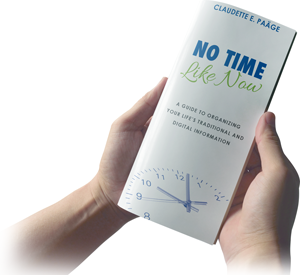 I created No Time Like Now after countless numbers of people kept telling me they wanted a simple guide to organizing information and important documents. This guide not only saves time overall, but follow the tips, and you’ll feel less stressed and more confident about where critical information is located if the situation arises. Safeguarding and storing your usernames and passwords. Click the button below to buy the either the PDF version or printed booklet (booklet requires shipping information). You will be redirected to a secure PayPal transaction. View it on any device! Put it on your smartphone, tablet or computer! Once purchase is confirmed, you will be redirected to a download page. Get all the information in one booklet. Upon ordering, you will be asked to give shipping information. over the details of everyday living. My last cell phone bill was more than $220 for one month of basic services. Crazy! After reading Claudette’s tip suggesting we contact our carrier every six months to see what promotions they’re running, I decided to make the call. Sure enough, they had a special promotion. Now my cell bill is just $86 per month. That’s a savings of more than $1,500 per year, and I love it! This booklet has real life tips, and I’ve got proof. I came home from getting a prescription that costs $60/month for the co-pay, and I wasn’t happy. So, I decided to try what the booklet said –– I searched online for savings from the pharmaceutical company. I was so excited when I found an offer that brought the price to just $10 per month. Then, I received a savings card from the manufacturer, took it to the pharmacy and they refunded the $60 I paid the first month. Thank you for showing me how to do this, Claudette Paäge! We always pride ourselves on being technically-savvy around here. But when I read the tip about keeping a current list of assets, I was shocked to realize we hadn’t put even one digital asset on our list. What an eye opener! Now, we’ve pulled together information for all of our online financial accounts as well as websites where we store valuable images and sell products. What a relief to know we have a record of these assets now, and won’t struggle to find them if something happens. Let me first congratulate you on completing this project. How many days did you say “I’ll finish it tomorrow.” But when tomorrow comes, you reach for another excuse. Well, I am so happy you did not run out of tomorrows. This is a winner! I will have to read it slowly because you have included so much valuable information. There is so much in this book I had either not thought of or taken for granted. Something as basic as blood type, we never really think about because we don’t see ourselves ever really needing to know. This book makes you really think. Having all your personal information organized means peace of mind. Can’t wait to see the next book.